There are two types of mice in Britain that may become pests, the House Mouse and the Long-Tailed Field Mouse. Mice, like rats are also a major hazard to health as they can spread disease and can contaminate food. Apart from causing food damage due to their gnawing action, they can also cause considerable structural damage. However, unlike rats they are less dependent on water and will normally obtain sufficient moisture from their food. The adult house mouse may weigh up to ½oz (15gm); usually has brown fur on its back and is grey underneath; its ears are fairly large in relation to its body and its feet are small. The tail is the same length as the head and body but is much thinner than the tail of a young rat. Mice are widely distributed throughout urban areas and in farm buildings. 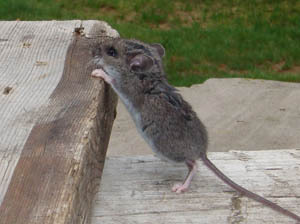 The long-tailed field mouse is common on agricultural land but is not generally considered a pest unless it takes up residence indoors. The house mouse is a more common domestic pest which will nest in partitions, floors and behind wall boarding. Mice are most active at night and will range over a very small area if food is plentiful. They are less dependent on water and will normally obtain sufficient moisture from their food. Mice, like rats, are a major hazard to health. They are responsible for the spread of many diseases, some of which can be fatal to man. They eat food which may be intended for human consumption and contaminate much more, with their urine, droppings and fur, which must then be disposed of. Mice will also cause structural damage to property by gnawing through woodwork, wires, pipes and household items. The life expectancy of mice is around one year during which time a female may breed up to six times. The average size of a litter is six. Breeding occurs throughout the year but especially in the Spring and Autumn. • scratching and gnawing sounds from the loft, under the floorboards and in wall cavities. You will need professional help in controlling colonies of mice. They are particularly difficult to control because of the rate at which they breed and are able to colonise new areas. If you suspect you have a mouse infestation in Edinburgh, Glasgow, Aberdeen, Dundee or Perth, call GRAHAM pest control today and we could help.